Works exactly as advertised (Glad I reminded you). Thanks alot for this Chris. I think I may just unistall Illustrator – now that I have this tool. 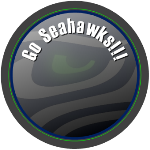 I heard one of the sports guys on the radio say; “The Hawks really had their soy lattes handed to them by Green Bay” Hah! Good to be back in the Seattle area! And props to all you Wisconsin Visio Guys out there! I’m sure I am missing something simple. How do I get the shapes from the document I downloaded into another document? Do I need to copy the macro to the other Visio document? Use the Visio diagram that you downloaded to build the text-on-a-circle that you want, then select the whole bunch and copy into another diagram. 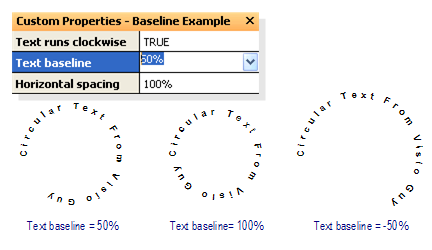 The other diagram won’t have the code necessary to create new text-on-a-circles, since it doesn’t contain the code. In this respect, the downloaded Visio file functions as a tool. I use Visio extensively for schematics and layout drawings of our DC Power gear. My diagrams form the basis for a lot of our marketing drawings (see http://www.enatel.co.nz/htmldocs/products/systems.html). Anyway, I’d like to do text-on-a-line, a bit like the circle thing, but something that will line up with an isometric or perspective drawing – and something editable in Visio (not WordArt). Got anything clever along these lines (excuse the pun!!!). Junichi Yoda created a really cool set of isometric piping shapes for Visio years ago. As part of the package, he includes isometric fonts (left and right) that might help you out. Check out what he did here: Visio shapes and stencil for piping isometrics by Junichi Yoda. without it you can’t move things around. as well to have resizing work in the target application. Both of those tripped me up, but I was able to figure it out after a little testing. Thanks for the tool, when’s the next version due out? I was wondering if there was a way to put the text generator into a macro that could be able to appear into any document? This is an amazing tool. You’d think Visio would have had this since, oh 97 or so? One recommendation for an extra property. The text currently anchors on the rotating line as left justified, it may be more useful to make it centered so that angles are predictable (i.e. two circles with text at +60 and -60). So the property might involve a left/center/right justified button. Great tool! 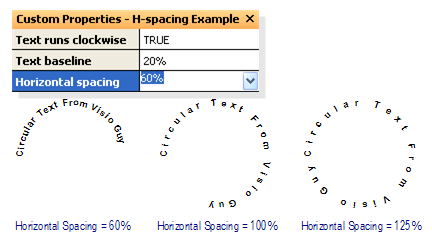 I was looking to fit texts on elliptic paths in Visio, and found your post. Your tool is helpful enough that I am willing to change my ellipses to circles in my present diagram. One “minor” request: Would it be too difficult to modify the text entry field so that it accepts Unicode characters? I used the standard VBA Input box and it must not handle the Unicode stuff. I’ll have to build a custom input dialog. I think that some of the VBA controls can handle Unicode. Or if anyone else gets around to doing this and wants to share, I’d be glad to re-post an update here. Just select all of the characters around the circle, and hit the bigger font button, or go to Format > Text. it works fine for me in one laptop. But in another one, I cannot get the action button to appear. The shape is there, because you can see its area highlighted when you click on where it is supposed to be but if you click on that “white highlighted area” you get a 1415 error. I repaired the Visio instalation, but it didn’t work. Just trying to make some tests, I tried to insert a “Microsoft Forms 2.0 CommandButton” on my own via “Insert\Control\” but then I get the error 1440. I would really appreciate any guidance on this as this tool is a must for me when working with Visio. I can’t group the letters created by the circular text generator. In fact, if I group them I can’t see them anymore. If I put a figure under the text and try to group them together I get a figure in the same place and the text somewhere else. When you group the letters together, make sure that you include the light-blue, dotted lined circular guide. It controls the various properties and location of the characters. When you group the characters without the guide, you cause problems, which get even worse if you delete the guide. The characters-plus-guide are one system that need each other. I downloaded Visio 2010 Beta, and thought you would like to know that this works with 2010 as well. It’s good to have great feedback like this! Is there a way to change the text later on? Its a pain to have to reapply all formats, once you want to change the text, or just fix a typo. how do u use this tool??????? drag and drop then???? It uses automation/code to get the job done. Like I said, the article that accompanies version 1 explains how to use the tool. If you are new to VBA macros, there is a link to that article as well. I have downloaded version 2 for visio 2. I have visio 3. I can’t get it to work. I have enabled the macos. The only thing I can get it to do is a circle of text. All of the functions mentioned do not work. How do I get them inserted into (defined) the custom properties???? Visio 3 is from 1993. This was developed in Visio 2003 or 2007. It will likely not work in Visio 3. I downloaded the Vers 2, but the generator is opening in Visio 2010 as “Read only” so I cannot use any of the new features. I can only generate the circular text. Unfortunately I need to adjust the spacing so it will fit in a partial layer. HELP! Not sure what you mean. Even if the file was read-only, you would still be able to manipulate objects, just not save them, no? Just generate some circular text, then copy it into another drawing, and don’t worry about saving. And the spacing adjustments are accomplished by selecting the guide-shape, then adjusting shape data fields (custom properties). Again, unrelated to “read-only”. Greetings from Edinburgh. Great tool. Spaces between words don’t seem to get included properly in Visio 2002. As you add each character in turn, does a space resolve to zero width or something? The spaces have always worked for me, and I don’t think they evaluate to zero. But I don’t think I’ve used it on anything older than Visio 2003. I do remember some change in the way text was calculated between 2002 and 2003–I did a huge conversion project for thousands of documents, but I can’t recall if this is a related problem. Can you select an existing letter in your circle, then type ” ” and see if the shape collapses? May be you have already created a version for Visio 2010? The versions here should work just fine in Visio 2010. I’m obviously doing something wrong, and could use some help. I’ve downloaded the generator (it opens in a separate Visio window), created circular text, and tried to copy and paste it into an existing Visio drawing. It seems to paste just fine, but once there I can’t even move it. It’s always stuck in one spot, and I can’t manipulate it at all. Please tell me what I’m doing wrong! 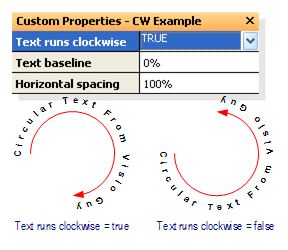 When you create the text, there is a circular guide that is created with the text. You don’t see it in the images above, but you can see them in the v1 article. When you copy the text, make sure you copy the “guide circle” with it. Not only do you move the text by moving the circle, it also gives you control over other aspects of the text via Shape Data (Custom Property) fields. These are discussed in both articles. Thanks Visio Guy! That sure fixed it. I don’t know why that didn’t stick out to me in the first place. This is sooo cool! Thank you guys so very much. The only thing i haven’t figured out how to do is updating the text once the circle is created. I am guessing that’s not possible. I love it but can’t get it to work- when I select the text and try to copy it to another diagram visio dumps it off to the side and I can’t move it or select it- how do I select all the letters and copy them into a concentric circle shape? You have to select the text and the guide circle when copying. Without the guide circle, the text doesn’t know where to go, and they probably jump to the lower-left corner of your page. This is a really great tool! Thank you! I just used it on Visio 2010 to make a logo for my music jam and it worked great. I created layers of circular text so I could have different font sizes and rotations on the same circle. Only thing is that Visio won’t shutdown. Not sure what is at fault, could be anything, but I can take care of that easy enough! Unfortunately, I couldn’t get this to work. I downloaded the file and already had my settings to allow macros, but when I press the “Generate” button, nothing happens. Any ideas? Hard to tell. If you’re handy with VBA, can you put a break point in this subroutine, and see if it’s even being called? This is the sub that the button calls first. your tool really helped me a lot!!! when i click the circular text generator button nothing happens, and I have set marcos to a variety of settings. when marcos are disabled i can move the box, when enabled it is clickable but nothing happens.